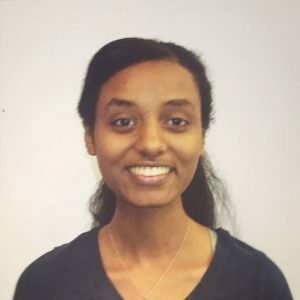 Tigist (Tiggy) is currently enrolled in the two-year master’s program in epidemiology (in the infectious disease epidemiology track) and is being advised by Dr. Caroline Buckee. Her interests lie in the interface of disease ecology and mathematical disease modeling, particularly for diseases with a substantial impact in low and middle-income countries. She explored this interest as an undergraduate student at Princeton, where she earned her B.S. in Ecology and Evolutionary Biology (with minors in Global Health and Health Policy and French Language and Culture). Her thesis at Princeton explored the patterns and impacts of vaccine confidence on meningitis dynamics in Nigeria and the UK, using on-the-ground surveys and Twitter data. Her interest in global health has also been motivated outside of the classroom and thesis work through a summer research internship at a pediatric clinic in a public hospital of Roatán, Honduras.